My sister got engaged last July and the wedding is this weekend. Needless to say the last couple of weeks have been a bit hectic. My brother arrived home from Australia after almost four years so there was excitement about that. Then my mother lost the top of her wedding outfit and one of her shoes for the wedding (don’t ask). This mishap resulted in a rushed trip to West Cork last Sunday and the hasty purchase of a whole new outfit. As luck with have it the missing items were discovered the following day after a new set of shoes had been acquired. 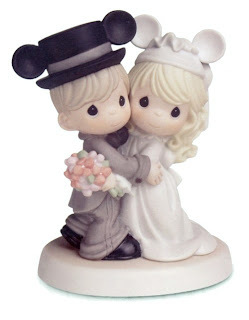 The figurine for the wedding cake also went on the missing list but has since been returned to the fold. I’ve already had an anxiety dream about waking up late on the morning of the wedding and missing the hair appointments. So I’m planning on setting about five alarm clocks for the morning of the wedding to make sure that we are up on time. Anyway I’m taking the next couple of days off before the wedding so that I can be primped to within an inch of my life. I’m even succumbing to a dreaded dose of fake tan! LOL. Alarm clocks never work for me, so dont pin all your hopes on them. # posted by GhostRose : April 01, 2007 6:40 p.m.
Hey Betty, hope it all went swimmingly! See ya tomorrow. # posted by Donal : April 03, 2007 11:52 p.m.